Note: Dollar amounts are in Canadian $ unless mentioned otherwise. USD-CAD 1.064 Price of 1 USD in CAD as of December 13th, 2013. It’s highly possible that you never heard of the MTY Food Group Inc. If you are a Canadian you probably consume their products on regular basis without ever knowing it. 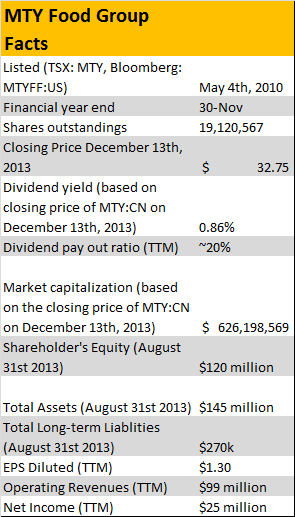 MTY is ~US$550 million small-cap company that operates over 2,500 locations under a collection of 31 outlets. Canadians are probably more familiar with names such as Country Style, Tutti Fruitti, Mr. Sub, Thai Express, Jugo Juice, Cultures, Extreme-Pita, or Tiki-Ming; all brands that MTY operates. As for the American market, in May 2013 MTY announced their first foray into the U.S. with the acquisition of Mucho Burrito, Extreme Pita and PurBlendz brands. The purchase comes with 40 U.S. locations and was finalized in September 2013. You can see from the chart above that MTY is outperforming the TSX, the bourse on which it’s listed, but also the S&P 500 and the S&P/TSX Consumer Discretionary Index. When you buy MTY, you’re not investing in the restaurants directly. Rather, you’re buying into a royalty stream based on a percentage of the restaurants’ sales and much more. For each plate that is sold MTY earns royalties. MTY simply collects royalties and has very low capital expenditures and financial risk. The math is simple; more franchises => more sales =>more royalties. Because of this successful recipe, MTY receives recurring revenues and as a result it currently sits on $45 million at the end of last quarter. This growing war chest is looking for targets that will be accretive to MTY. The credits goes to Flowingdata.com for the find and fathom.info for this awesome infographic. 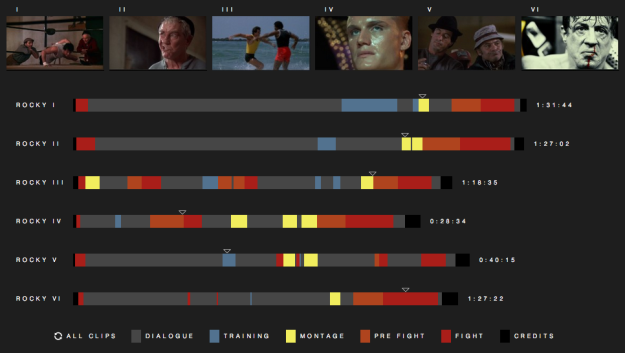 Fathom Information Design watched all six Rocky movies, classified segments into dialogue, training, montages, pre-fight, fight, and credits, and then visualized it. Rocky Morphology is the result.